Mandalay is a great starting or ending point to any trip to Myanmar. The best of Myanmar is located in this part of the country, and if your main Myanmar itinerary focuses on Bagan and Inle Lake start your trip in Mandalay. Travelling from Mandalay to Inle Lake or the other way from Inle Lake to Mandalay, you will have different modes of transport options to choose from. There are buses or shuttle buses from Mandalay to Inle Lake, or you can even hire a private driver to take you from Mandalay to Inle Lake. No matter what route you take, of all options are time-consuming, the road from Mandalay to Inle Lake will go through mountains and there are tons of turns. When planning out your Myanmar itinerary we suggest spending at least 3 days in Inle Lake as it will take one full day to travel to Inle Lake. Here are all the options when travelling to Inle Lake and choose the way what fits your travel budget and travel style. You can hire a private driver to take you to/from Inle Lake and you’ll be on your own time schedule. You will have the freedom to stop along the way and take photos as you drive through the mountains. It is now possible to fly to Inle Lake from Mandalay. The nearest airport to Inle Lake is the Heho airport (HEH), which is 46 kilometers from Nyaung Shwe. There are several airlines offering daily flights. Flying is the fastest and easiest way to travel to Inle Lake. If you are on a tight schedule in Myanmar I would fly rather than spending a whole day in the car. If you are on a Myanmar honeymoon we highly suggest flying because there is nothing romantic about buses & trains in Myanmar. Night buses and day buses to Inle Lake run every day of the week. The only proper full-size comfortable buses run at night, which means you will be arriving into Inle Lake at 3:30am-5:30 am. The only day buses are minivan shuttles where you will be crammed in there like sardines. The buses drop off right in the main town of Nyaung Shwe where there are tons of hotels and taxis within walking distance. If you are staying at a higher end hotel, it will most likely be outside of Nyaung Shwe and you’ll have to take a taxi or a local truck similar to a collective taxi. Inle Lake has a wide range of restaurant options, from a great rooftop bar to the best Indian restaurant. 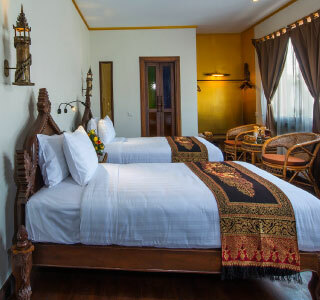 There is accommodation for every budget in Inle Lake with the higher end hotels located right on the lake. Staying at a hotel located outside of Nyaung Shwe has its ups and downs. You will have to take a taxi into Nyaung Shwe for more dinner and nightlife options, however, you will have gorgeous views of the lake.